So it's finally starting to cool off in the Northeast, Football season is starting and it seemed about time to make some chilli! 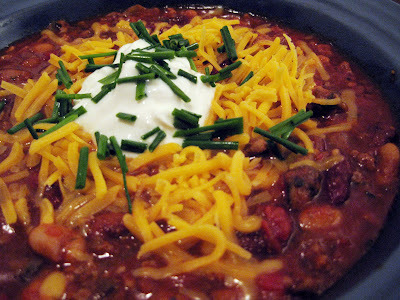 Both Jenn and I love chilli and my recipe changes pretty much every time but this is how I made it this time around. I usually use just kidney beans but this time around I decided to try some other beans as well. I've also done it with ground turkey and it's still pretty good but I like ground pork and beef best. served with sour cream, chives, shredded cheddar cheese and cornbread. I like to get a large pan nice and hot with a little olive oil and start off with the onions, mushrooms, garlic and meats. I saute everything together, turning the meat often to ensure it cooks completely. Once the meat is browned and the veggies are softened, I transfer everything into my crock pot and start adding the beans, crushed tomatoes and other ingredients. I let it cook in the crock pot pretty much as long as I can. I think this time I cooked it on high for a few hours, turned it to low for an hour or so and then left it on 'keep warm' overnight. Chilli is one of those dishes that only gets better the longer it goes and the next day it's usually ready. Jenn made some corn bread with whole wheat flour and we ate it with a little sour cream, cheddar cheese and fresh chives and it was excellent. It's really a great dish to make if you're feeding a bunch of people.